There is space for everyone to sit and dine together or, if you prefer, a quieter upstairs seating area with a TV and plenty of reading material! 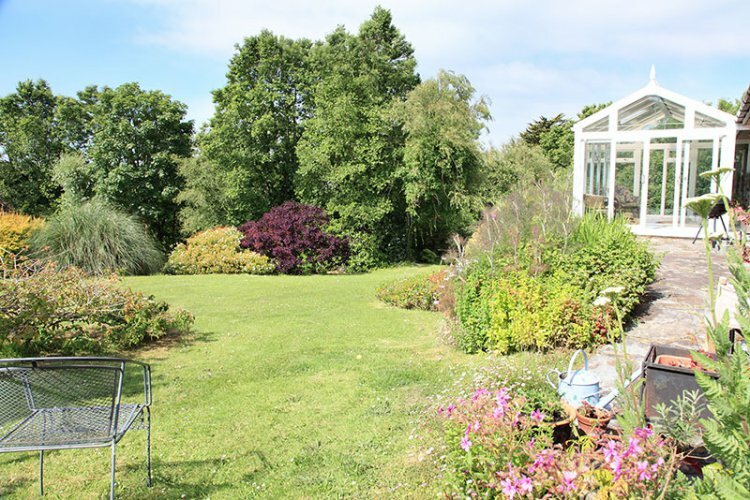 The conservatory provides even more space for sitting comfortably and enjoying the views of the garden. Outside is ideal for little explorers - with planted borders and lawned areas leading to a small copse complete with babbling brook. There are bedrooms and bathrooms on the ground floor, so the property could be suitable for the less able bodied. A spiral staircase takes you from the basement, complete with table tennis table, via the ground floor to the first floor with its own bedroom, bathroom and lounge area. There is a woodburner in the lounge with firelighters, kindling and wood provided for one evening only, thereafter extra supplies are the responsibility of the guests. Please use the fire guard provided. Remaining heating is by storage heaters. Large Lounge with 'Juliet' balcony overlooking the fabulous garden. Large smart TV, DVD player, music player. Large dining room, with table and chairs. Kitchen with large breakfast table, new 5 ring induction hob, large fridge, double oven, dishwasher. Spacious conservatory overlooking the garden. Master bedroom with door to garden, built in wardrobes, TV, modern en suite wet room and free standing cot. 2 x double rooms with 5' double beds overlooking the garden. 1 x spacious twin room with 2 x 3' single beds. Large bathroom with separate shower cubicle, heated towel rail, de misting sensor mirror, refurbished in 2017. Separate toilet and hand basin . Spiral stair leading up to a large landing lounge area with TV and selection of books and a stair gate. Very large bedroom with 4 x single beds, second cot, and hanging space. Double bedroom with 5' double bed, velux window with blind. Bathroom with shower over bath installed in 2017 with de misting sensor mirror. Towels are provided. Please bring your own beach towels.